Start Up Loans are repayable loans available to individuals over the age of 18 who have a viable business idea but no access to finance. They are part of a government backed scheme, delivered by The Start Up Loans Company, and Outset Finance is an official delivery partner of this scheme. Start Up Loans are personal loans, which you as an individual then invest in your business. However, the approval process focuses on the ability of your business to generate sufficient income to make the loan repayments, rather than your personal credit history and credit scores. If you are yet to start, or in your first two years of trading, then you will probably be eligible, though please review our full eligibility criteria before applying. 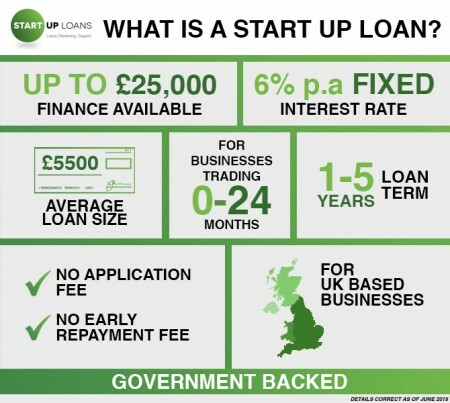 Start Up Loans come at a competitive, fixed rate of interest at 6% p.a. (or 6.2% APR), and must be repaid via monthly instalments within five years. For the very strongest applications, we can consider a request for a £25,000 loan, however you can borrow as little as £500. On average our clients borrow between £5,500 and £10,000. If there are several partners in your business then each person is eligible to apply for an individual loan to put towards the business, however this must be reflected in the cash flow forecast you submit with your Start Up Loans application. Please note, the Start Up Loans scheme does not offer grant based funding. It offers finance in the form of loans only, with monthly loan repayments forming a primary condition of the loan agreement you accept and sign if your application is successful. Additionally, like other credit commitments, failed Start Up Loan repayments may affect your credit score and formal action may commence if you miss your loan repayments.